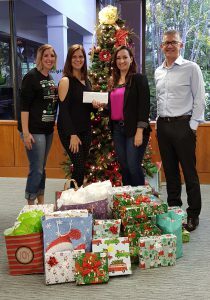 HighWater, a Cayman Islands provider of independent directorship and ancillary services, used their annual Christmas party to give back: assisting CICC’s efforts to offer safe shelter for female victims of domestic violence and their children. HighWater, a provider of independent directorship services to the alternative investment funds industry, hosted its annual Christmas brunch to raise money from clients and industry peers for the Cayman Islands Crisis Centre (CICC). CICC, the shelter for female victims of domestic violence on the Cayman Islands, was given a remarkable USD$18,000 to finance its ongoing work to protect victims of domestic violence. The large sum was made possible through the incredibly generous donations of attendees to the annual event, hosted at Abacus on Saturday 8th December. The attendees enjoyed a lush champagne brunch while the children got into the festive spirit by watching The Grinch together at the cinema. The large sum that was raised will help to support the important work that the CICC conducts over the course of the year, including operating the safe shelter that housed 34 clients in the month of November alone; Estella’s Place which is a drop-in centre, the TAYA Lounge, an interactive programme for at risk teens that seeks to end the cycle of violence and most recently a kids HelpLine, a 24/7 call centre specifically for children and teens who are in distress. HighWater has been hosting this Christmas party and giving to the CICC for the past 11 years. “We are incredibly thankful for HighWater’s assistance in tackling the issue of domestic violence in the Cayman Islands. The amount of money raised goes directly to the Crisis Centre, and the positivity sends out a message that can help women to feel empowered and aware of the support network they have around them. For more information on the Crisis Centre, please visit The Crisis Center Cayman Islands or call 949 0366.